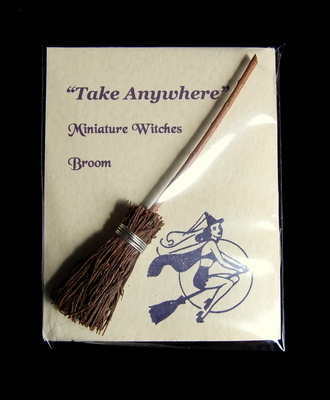 This miniature witches broom is ideal for the witch who loves to cast spells on the go or simply doesn't have the room for a full sized broom. They have been Hand crafted by Moon Goddess Garden from heather which is well know for its association with luck and good fortune. Besom or witches brooms are widely used in wiccan ceremonies and spell crafting. They remove negativity, cleansing the area before a ritual or spell. I keep mine by my computer to keep the area free of negativity. It can also be used in the car as a Talisman for safe journeys. The broom itself is approx 6" in length, perfect size for handbags and spell bags. Each Broom will be slightly different as they are all hand made. Makes the ideal gift for the Witch in your life!